What's new in the GBCAT v1.1? What’s new in the GBCAT v1.1? – fixed: Kenwood TS-2000 remote scenario, slider initialization for Sub-R Audio and MainR Squelch. – fixed: Kenwood TS-2000 remote scenario, S-meter and W-meter now are ok.
– fixed: Yaesu FT-8×7, showing info about active VFO now is ok.
– fixed: Info window now showing selected RIG. – fixed: In the scenario when we have up and running one instance of GBCAT in direct RIG controlling and we want to start another GBCAT instance for remote RIG controlling, now we can select “None” COM port, which enables “Start IP2COM Server” selector. – fixed: Yaesu FT-857, direct frequency entering via green buttons is fixed and now can be used on every 857. – added: GBCAT, Kenwood TS-2000, the four configuration lines are added for memorizing values for MainR Audio, SubR Audio, MainR Squelch, SubR Squelch. 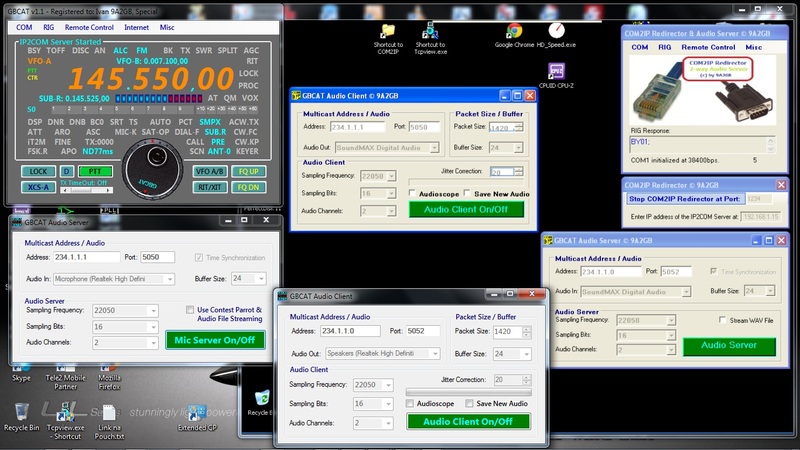 – added: GBCAT, Yaesu and Kenwood, menu “Remote Control/IP2COM Server”, added menu selector “Remote PC’s display switch off”. – added: GBCAT, Yaesu and Kenwood, menu “Remote Control/IP2COM Server, values for the “Local IP2COM Port” and for the “Remote COM2IP Redirector IP” are memorized in the GBCAT.CFG. Related to it, there are 2 lines more in the GBCAT.CFG : LOP=port_number, RIP=IP_address. – added, GBCAT, Yaesu and Kenwood, Progress bar indicator while initializing RIG controls over TCP/IP (Remote scenario only). – added: SPACE key (space bar) can be used also as the PTT on/off control, while mouse is inside of the GBCAT form (thanks to Robert 9A3BRV for an idea). – added: Help in Italian language, thanks to Silvio I1SU. – added: The values for the Redirector’s Port and for the IP2COM’ Server IP are memorized in the COM2IP.CFG. Related to it, there are a two lines more in the COM2IP.CFG: LOP=port_number, RIP=IP_address. – In order to keep reached communication quality for the all supported RIGs, the all communication routines are separated now. This entry was posted in Amateur Radio (HAM) and tagged GBCAT v1.1 by Ivan. Bookmark the permalink.